(1) Neurosurgery Department. Hospital General Universitario de Alicante. (Spain). (2)ENT Department. Hospital General Universitario de Alicante. (Spain). (3) Histology and Anatomy Department . Universidad Miguel Hernández de Alicante (Spain). The orbit is the complexly organized group of neural, vascular, muscular, ligamentous, and osseous structures that opens onto the face and external world to collect and provide binocular visual information to the brain. The fact that many of the neural and vascular structures entering the orbit pass through not only an osseous channel, but also through the annular tendon, creates an added complexity when considering approaches to the orbit and especially those involving the orbital apex. The orbit can be approached surgically from anteriorly through the face and conjunctivae or through any of its walls and from intracranially. The most common neurosurgical approaches are directed through the superior and lateral walls to lesions located deep in the orbit near the apex or involving the optic canal, superior orbital fissure, and adjacent areas. Fig 1. The walls of the orbit are formed by seven bones: frontal, zygomatic, sphenoid, lacrimal, ethmoid, and palatine bones and the maxilla. The upper border of the orbital opening is formed by the frontal bone. The lateral border of the orbital opening is formed by the frontal process of the zygomatic bone, except for the upper part, which is formed by the zygomatic process of the frontal bone. The lower margin of the orbital opening is formed laterally by the zygomatic bone and medially by the maxilla. The upper part of the medial border is formed by the frontal bone and the lower part is formed by the frontal process of the maxilla. The medial part of the upper border contains the frontal sinus. Fig 2. The walls of the orbit are formed by seven bones: frontal, zygomatic, sphenoid, lacrimal, ethmoid, and palatine bones and the maxilla. The upper border of the orbital opening is formed by the frontal bone. The lateral border of the orbital opening is formed by the frontal process of the zygomatic bone, except for the upper part, which is formed by the zygomatic process of the frontal bone. The lower margin of the orbital opening is formed laterally by the zygomatic bone and medially by the maxilla. The upper part of the medial border is formed by the frontal bone and the lower part is formed by the frontal process of the maxilla. 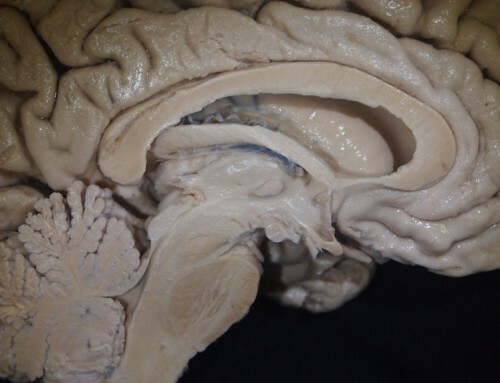 The medial part of the upper border contains the frontal sinus. Fig 3. The floor of the orbit is formed by the orbital plate of the maxilla, the orbital surface of zygomatic bone, and the orbital process of the palatine bone. The floor is continuous with the medial wall, except in the most anterior part, where the floor is perforated by the nasolacrimal canal (NLC). The anterior part of the floor is continuous with the lateral wall, but posteriorly, the floor and lateral wall are separated by the inferior orbital fissure (IOF). 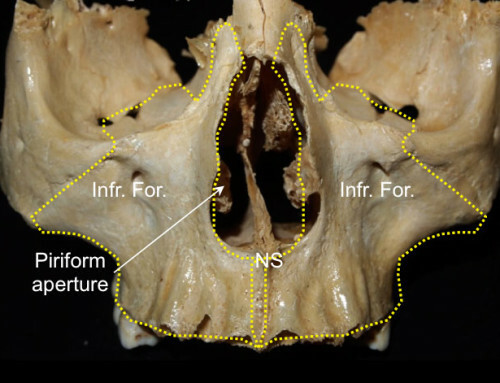 The infraorbital groove (IOG) leads forward out of the inferior orbital fissure to cross the floor to reach the infraorbital canal, which ends below the lower orbital rim in the infraorbital foramen. Fig 4. The lateral wall consists predominantly of the greater sphenoid wing and the frontal process of the zygomatic bone. Superiorly, the anterior part of the lateral orbital wall is continuous with the roof, but the posterior part of the lateral wall is separated from the roof by the superior orbital fissure (SOF). The lacrimal foramen (LF), which transmits the recurrent meningeal branch of the ophthalmic artery, is located anterior to the superior orbital fissure along the superior edge of the lateral wall. on the anterolateral part of the intraorbital surface of the lateral wall are the zygomaticofacial (ZF) and zygomaticotemporal (ZT) foramina crossed by the zygomaticofacial and zygomaticotemporal nerves, which exit the external surface of the zygoma to reach the skin of the cheek and temple. Fig 5. The medial wall is formed, from anterior to posterior, by the frontal process of the maxilla, the lacrimal bone (LB), the orbital plate of the ethmoid bone or lamina papyracea (LP), and the body of the sphenoid bone. The medial wall is extremely thin, especially in the area of the orbital plate of the ethmoid bone, which separates the orbit and ethmoid air cells. The anterior and posterior ethmoidal foramina (white and yellow arrows), which transmit the anterior and posterior ethmoidal branches of the ophthalmic artery and the nasociliary nerve. Fig 6. The optic canal (OC) opens into the superomedial corner of the orbital apex at the junction of the roof and medial wall. It is separated from the superior orbital fissure (SOF) by the optic strut (OS), a bridge of bone, also referred to as the posterior root of the lesser wing, which extends from the lower margin of the base of the anterior clinoid process to the sphenoid body. Fig 7. From an intracranial view we can see how the optic strut (OS) is a bony projection of the anterior clinoid process (AC) to the sphenoid bone. It separates the optic canal (OC) from the superior orbital fissure (SOF). The annular tendon (yellow circle ) is a fibrous structure where the orbital muscles are attached. The annular tendon is attached along the upper, medial, and lower margins of the optic canal, and to a bony prominence at the midportion of the lateral edge of the superior orbital fissure. All the components of the orbita pass trough the annular tendon but the fourth, the frontal, the lacrimal nerves and the ophtalmic vein. The central sector of the superior orbital fissure, referred to as the oculomotor foramen ( red circle ) because it is the part of the fissure through which the oculomotor nerve passes, contains also the nasociliar nerve and the abducens nerve. OA: ophtalmic artery; Inf. Oblique: Inferior oblique muscle; Inf. Rec: Inferior rectus muscle; Lat.Rec: Lateral rectus muscle; Med. Rec. : Medial rectus muscle; NC: nasociliar nerve; Sup Oblique: Superior oblique muscle; Sup. Rec: Superior rectus muscle; V1 fron: frontal nerve; V1lac: lacrimal nerve; Ov: ophtalmic vein; IIIs: superior division of 3rd cranial nerve; IIIi: inferior division of 3rd cranial nerve. Yellow circle: annular tendon. Red circle: oculomotor foramen. The muscles and its corresponding cranial nerve are exposed together. Fig 9. In order to understand the pathway and position of the orbital apex components we have dissected a right cavernous sinus. Fig 10. After the clinoidectomy, we can note the clinoidal segment of the internal carotid artery ( ICA ). We have also drilled the attachment of the clinoidal process: the optic strut (OS). Let’s see how the optic strut is a triangle shaped area bounded by the ICA, the optic nerve and the superior orbital fissure ( SOF ). Fig 11. Here, the usual origin of the ophtalmic artery (OA) just above the distal dural ring (DDR) and above the optic nerve. Fig 12.In this dissection we see the trochlear, frontal, and lacrimal nerves, all of which pass through the superior orbital fissure outside the annular tendon. Fig 13. Now the nerves located ouside the annular tendon have been reflected. The annular tendon and its subdivision, the oculomotor forman are exposed. Fig 14. 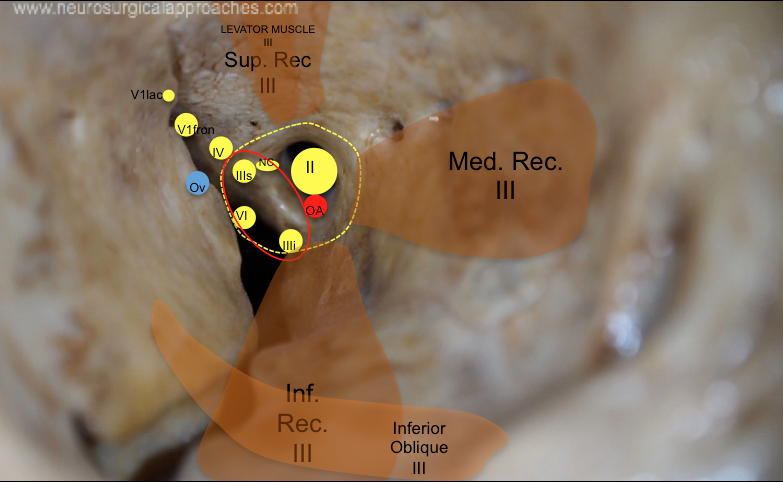 The nasociliar ( NC ) and sixth nerves have medial trajectories inside the cavernous sinus. Fig 15. Enlarged view of right side orbit. The ophthalmic artery (OA) and the nasociliary nerve (NC) enter the orbit on the lateral side of the optic nerve (ON) and crosses medially above the nerve. The abducens nerve (VI) enters the medial surface of the lateral rectus muscle (LRM). The optic nerve is enclosed in the optic sheath. The nerve to the inferior oblique muscle (IIIi) courses along the lateral edge of the inferior rectus muscle (IRM). IRM: inferior rectus muscle; LRM: lateral rectus muscle; MRM: medial rectus muscle; NC: nasociliary nerve; OA: ophtalmic artery; ON: optic nerve; IIIi: third cranial nerve (inferior division); VI: sixth nerve. Fig 16. Medial view of the right orbit. 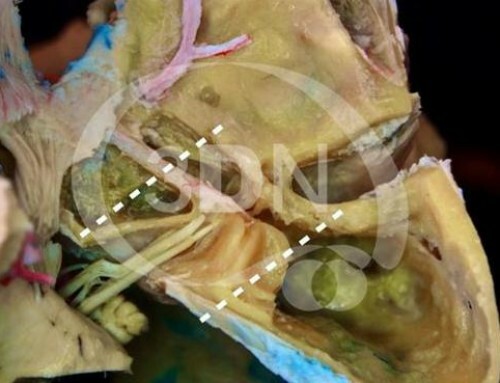 The lamina papyracea and esphenoid bone has been removed in order to show the the medial muscles: the medial rectus muscle (MRM) and superior oblique muscle (SOM). We can also see the trajectory of the sixth nerve in a medial position inside the cavenous sinus. The infraorbital nerve (IO) , branch of V2, passes below the orbit from its origin at the pterygopalatine fossa (PPF). The internal maxillary artery (IMAX) divides into several branches at the pterygopalatine fossa. Fig 17. The superior view of the orbit is probably the most usual in neurosurgical surgeries. From this view we can see the boundaries of the orbit: the medial wall formed by the lamina papyracea (LP), the lateral with the greater sphenoid wing (GSW) , the anterosuperior formed by the supraciliar arch (SCA). Fig 18. After the roof is removed we see the periorbita: the fascial sheet that encloses the eyeball and its muscles that is continuous medially with the periosteum of the bones forming the orbit. All the structures contained inside the periorbita are surrounded of fat. Fig 19. The orbital fat has been removed. The ophthalmic nerve (V1) divides into the lacrimal (V1lac) , frontal (Front), and nasociliary nerves. 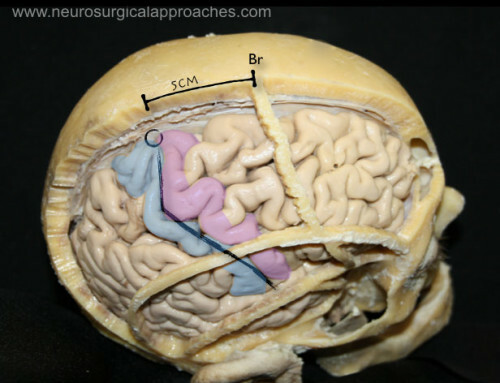 The frontal nerve passes through the superior orbital fissure and courses on the levator muscle (LSM) where it divides into a supratrochlear nerve (STn), which passes above the trochlea of the superior oblique muscle, and the supraorbital nerve (Son), which passes through a foramen or notch in the supraorbital margin. The lacrimal nerve passes above the lateral rectus muscle to innervate the lacrimal gland and convey sensation to the area around the lateral part of the supraorbital margin. The trochlear nerve (IV) passes medially above the levator muscle to reach the superior oblique muscle (SOM). The nasociliary branch of the ophthalmic nerve passes between the superior rectus muscle (SRM) and the optic nerve to reach the medial side of the orbit. The tendon of the superior oblique muscle passes through the trochlea (T) and below the superior rectus muscle to insert on the globe between the attachment of the superior and lateral rectus muscle. Fig 19. The frontal nerve and the levator and superior rectus muscles have been divided and reflected. This exposes the superior ophthalmic vein (SOV), ophthalmic artery (OA) and nasociliary nerve (NC) as they pass above the optic nerve (ON). Fig 21. The levator and superior rectus muscles have been reflected to expose the ophthalmic artery (OA) coursing above the optic nerve (ON). The ophthalmic artery passes above the optic nerve and between the superior oblique and the medial rectus muscles, where it gives rise to the anterior and posterior ethmoidal arteries (EA). The picture also exposes the central retinal artery (CRA) arising of the ophtalmic artery. Laterally, the lacrimal nerve and artery passes above the lateral rectus muscle to innervate and irrigate the lacrimal gland inferior view. In the superolateral aspect of the orbit: the lacrimal artery (LacA) and nerve (V1Lac) passes to reach the lacrimal gland. Fig 22. The superomedial view ot the orbit. The anterior (AEA) and posterior (PEA) ethmoidal arteries are exposed passing between the superior oblique and the medial rectus muscles. 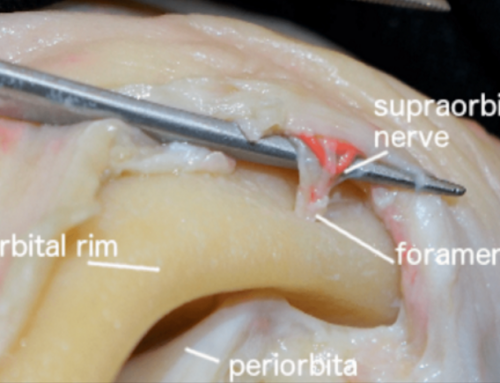 The tendon of the superior oblique muscle (SOM) passes through the trochlea (T) and below the superior rectus muscle (SRM) to insert on the globe between the attachment of the superior and lateral rectus muscles. The recurrent meningeal artery (RMA) that passes backward through the superior orbital fissure to reach the dura. The ciliary arteries (CIL.A), coursing around the nerve, are divided into long and short and anterior ciliary arteries. The long and short ciliary arteries pierce the sclera around the optic nerve and supply the choroidal coat and ciliary processes. The anterior ciliary arteries are derived from the muscular branches of the ophthalmic artery and run to the front of the globe with the tendons of the extraocular muscles, where they pierce the sclera and end in the greater arterial circle of the iris. The central retinal artery (C.R.A) which is the first and one of the smallest branches of the ophthalmic artery, arises medial to the ciliary ganglion, pierces the lower surface of the optic nerve (ON), and courses a short distance inside the dural sheath of the nerve before passing to the center of the nerve and forward to the retina in the center of the nerve. The ethmoidal arteries (EA) passing between the superior oblique and the medial rectus muscles. Fig 24. Lateral view of the orbit. The ciliary ganglion (CG) is situated on the inferolateral aspect of the optic nerve and on the medial side of the lateral rectus muscle (removed in this picture). It receives three branches: the motor (parasympathetic) root from the inferior division of the oculomotor nerve, the sensory root from the nasociliary nerve, and sympathetic fibers from the plexus around the internal carotid artery.The short ciliary nerves pass from the ganglion to the globe. 1-Harris FS, Rhoton AL Jr: Anatomy of the cavernous sinus: A microsurgical study. J Neurosurg 45:169–180, 1976. 2-Housepian EM: Microsurgical anatomy of the orbital apex and principles of transcranial orbital exploration. Clin Neurosurg 25:556–573, 1978. 3-Natori Y, Rhoton AL Jr: Microsurgical anatomy of the superior orbital fissure. Neurosurgery 36:762–775, 1995. 4-Rhoton AL Jr, Natori Y: The Orbit and Sellar Region: Microsurgical Anatomy and Operative Approaches. New York, Thieme Medical, 1996, pp 3–25.